This year we’re offering a whole weekend of edible gardens for you to visit. That means you can see more gardens and spread it over a weekend if you prefer. 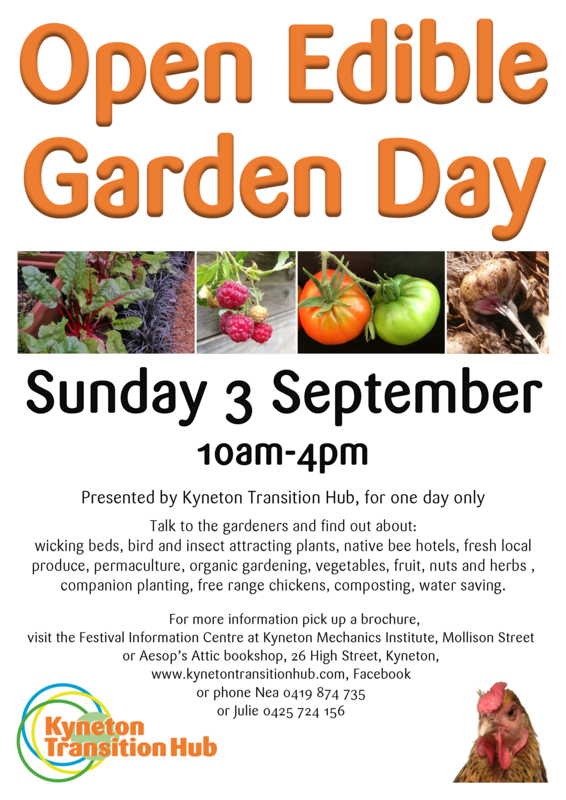 Kyneton Transition Hub Open Edible Garden Day is on Sunday 3 September 2016 (one day only) between 10 am and 4 pm at various times. Eight keen gardeners from Kyneton and surrounds are opening their edible gardens to show others how sustaining and life affirming an edible garden can be. It’s also about learning practical, inexpensive ways of replenishing the soil, water management and methods of weed and pest control using natural, chemical free methods. Edible gardens give us access to fresh wholesome foods grown for taste not transportation and to achieve low food miles and food security. 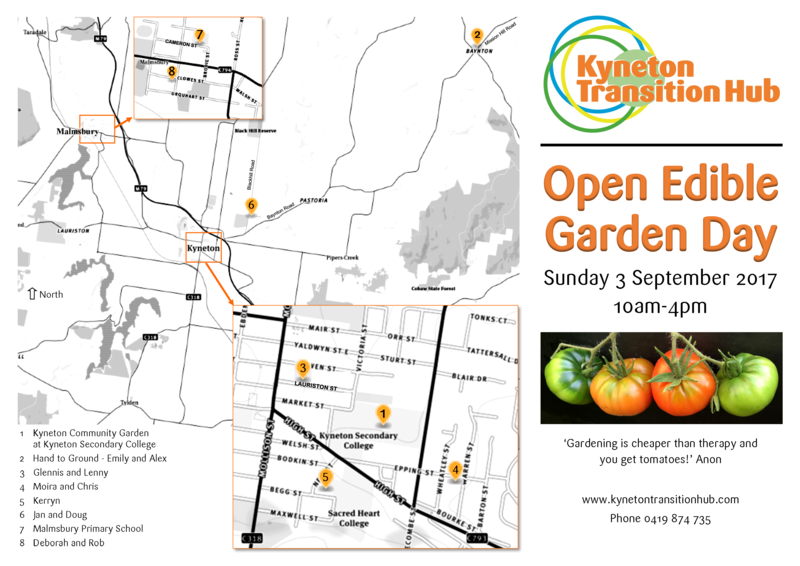 You can find out where these gardens are and opening times in a Kyneton Transition Hub brochure or the Kyneton Daffodil and Arts Festival brochure which are available at Aesop’s Attic Bookshop, various shops and the Kyneton Mechanics Institute which is the official information centre for the Festival. 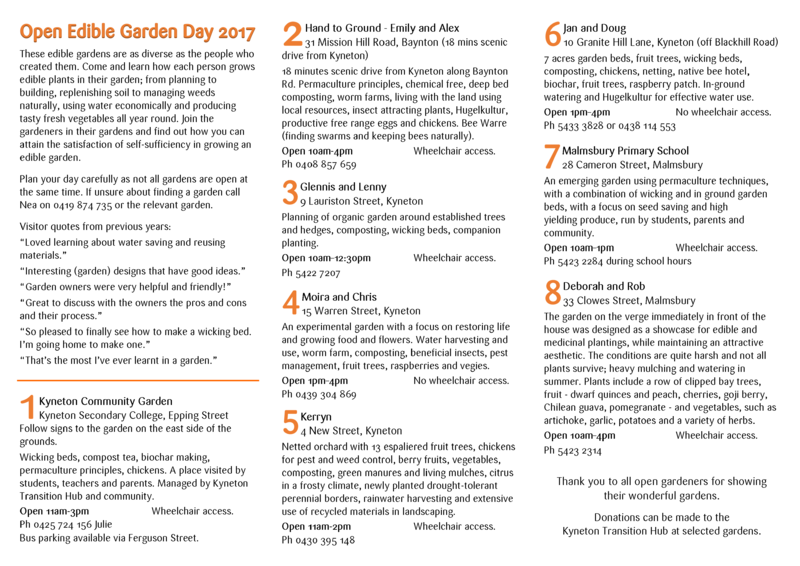 Please note that this Open Edible Garden Day is on one day only Sunday 3 September 2017 (Father’s Day), and not Saturday 2 Sept as advertised in the Kyneton Daffodil and Arts Festival brochure. 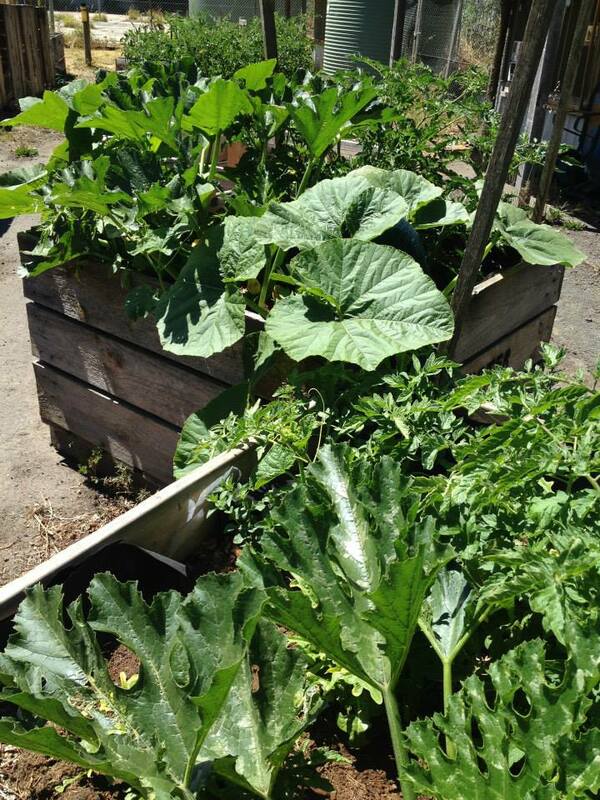 The Open Edible Garden Day gives locals a great opportunity to see what others are doing in our community. The Open Edible gardens will demonstrate edible gardens in progress from vegetables to fruit and nut trees, herbs, companion plants, bird and insect attracting. You will find new ways of improving soil, worm farms, composting, compost tea, wicking beds, Hugelkultur, irrigation and more. Nea Gyorffy, organiser, says “We want visitors to go away thinking ‘I can do that!’”. 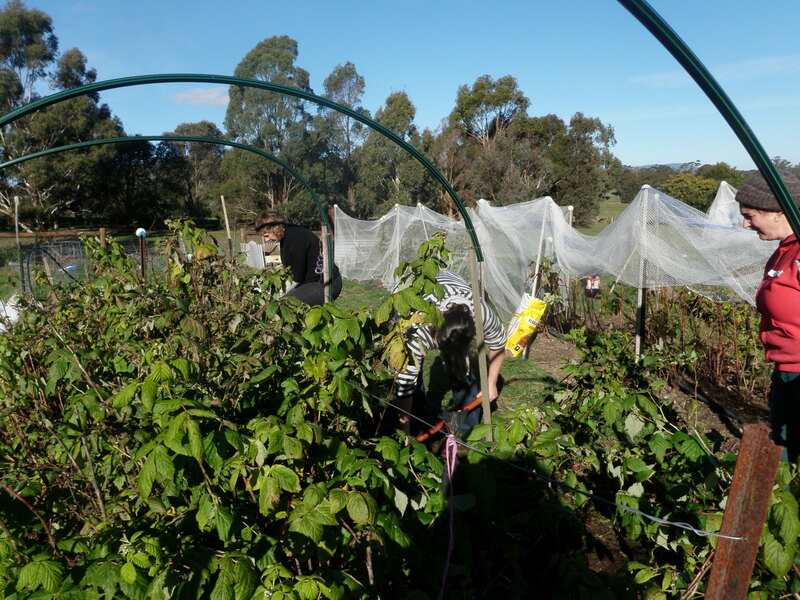 The Community Garden at the Kyneton Secondary College and Malmsbury Primary School garden will demonstrate what the school and community can achieve together. A verge garden in Malmsbury demonstrates how to transform a dry grassy slope into a hardy and attractive edible garden. More information at Kyneton Daffodil & Arts Festival website or facebook page; or Kyneton Transition Hub facebook page. Kyneton Transition Hub is a part of the international transition town movement and is concerned with sustainability issues in a broad sense. Our special focus is on building strong and resilient communities in a future of peak oil and climate change. 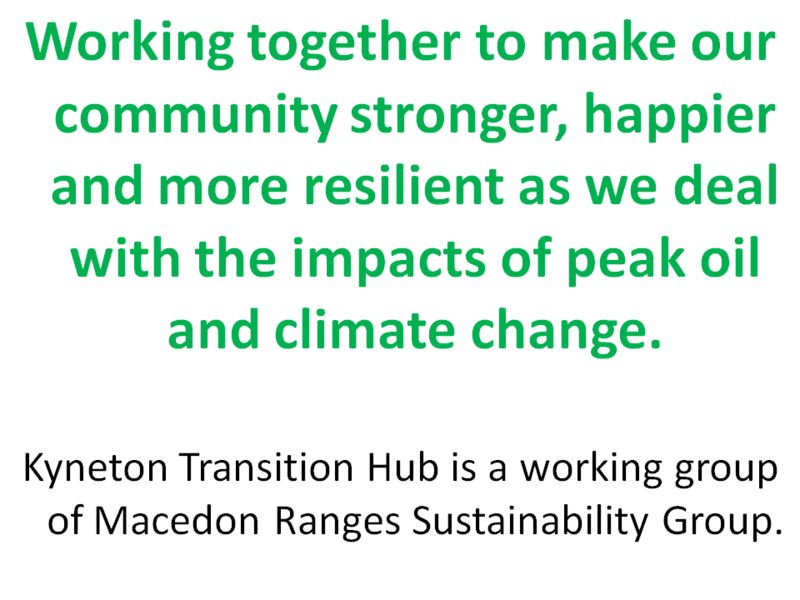 Our vision for the Macedon Ranges region includes initiatives to make our region more resilient and sustainable and also ways to contribute to a more resilient and sustainable world. The targets fall far short of what is required to contribute a fair share in addressing climate change. For Australia (and the world) to reach carbon neutrality by 2050 is too little, too late to avoid catastrophic effects; to take that as our target when we are a relatively wealthy part of the world is far too little. We should be aiming for 50% reduction in the life of the current council (2020), and neutrality during the subsequent council (2024). This will be aided by quickly advancing technologies (e.g., battery storage) but should also be a budget priority. The council should take responsibility for their overall impact on climate not just those things that are measurable. For example, actions on green power and waste should not sidelined as they are not happening in our back yard or not measured as the council’s direct impact. Green power should be the norm and waste issues need to be addressed as if we owned the land fill sites. The council’s attitude to this is a little like the sailor who is happy that the leak is in the other end of the boat. Divestment from fossil fuel and other unsustainable industries should not be something we consider or plan for the future. It should be something we undertake immediately and finalise within the life of the current council. Again, we’re in that leaky boat. We support the move to invest in renewable energy for council owned buildings but would prefer much quicker progress, especially as when the payback period is over there are continuing savings in both money and carbon. There are many community-owned buildings in the region, and council should encourage and facilitate their installation of solar PV. Council should also encourage and support community-owned renewable energy initiatives like the solar and wind farms in Woodend. Urban agriculture should be encouraged through edible trees on nature strips, a clear and positive nature strip garden policy, support for community and neighbourhood gardens, and encouraging edible gardens on under-utilised council land and open spaces. It may be difficult to measure the carbon impact of these initiatives however that does not mean they should be overlooked. Support for local agriculture that recognises its role in carbon reduction and sequestering. Encourage and support proactive initiatives such as soil enrichment, regeneration and the use of biochar. Resilience and sustainability can only be achieved if equitable solutions are sought. This relates to food security issues, homelessness and access to housing. Council should work with other groups to help secure equitable outcomes for all. Work with local communities and community groups to preserve and enhance our local parks, botanic gardens and nature reserves. Enhance council decisions by embedding community consultation into the processes. This is likely to be some form of deliberative democracy such as citizens juries. This is only a brief outline of our key concerns. We would be happy to discuss this in more detail as the climate change action plan takes shape. Come for the whole session or just a while. No sewing experience needed – lots of fun jobs – sewing machines, scissors, etc. available or bring your own. Kids welcome. BUPA Boomerang Bag sewing bees will be on every second Thursday of the month. Do you find it hard to remember to take your reusable bags when you go shopping? There’s a solution on its way and it’s coming from the Kyneton community supported by Kyneton Transition Hub and Kyneton Community & Learning Centre. An enthusiastic group of locals is organising sewing bees to deliver community made and shared reusable cloth bags where you need them most. This is part of the Boomerang Bag initiative started by two young women on the Gold Coast in 2013 which is now expanding around Australia and overseas. Its aim is to reduce plastic bag use and protect ocean life. For more information on the Boomerang Bag movement check out their website. The bags are made from donated fabric and upcycled clothing and linen. Donations of fabric and linen are already coming in, and if you have a sewing machine, iron, overlocker or other sewing equipment you no longer want the group would love to hear from you. 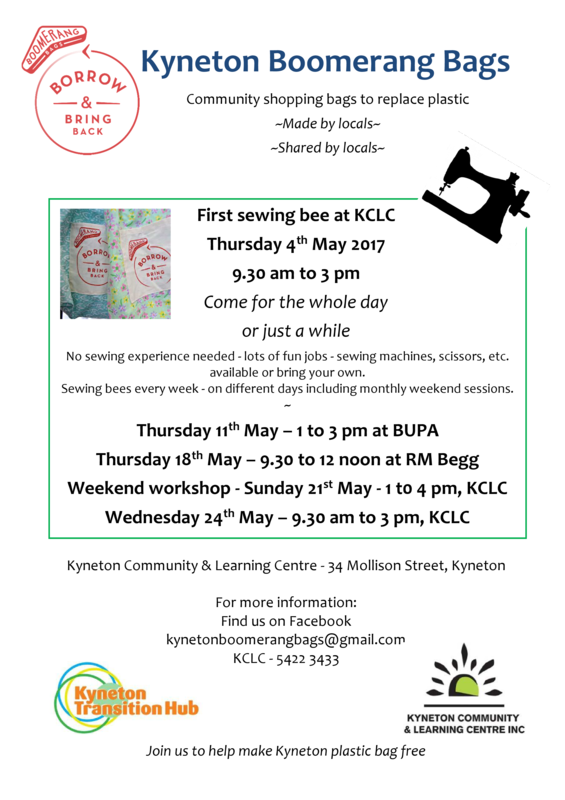 The first sewing bee is on Thursday 4th May at the Kyneton Community & Learning Centre (KCLC) from 9.30 am to 3 pm. Come for the whole day or just a while. Sewing machines, scissors, etc. are available or bring your own. No sewing experience is needed and there are lots of fun jobs including cutting fabric, ironing, pinning and screen printing. Kids are welcome. Regular sewing bees will also be hosted by BUPA and RM Begg to make even more connections in the community. Monthly weekend sessions are also available. If these days don’t suit please contact the group as sewing bees will be scheduled to suit everyone and further partnerships with schools and other community groups will be welcome. 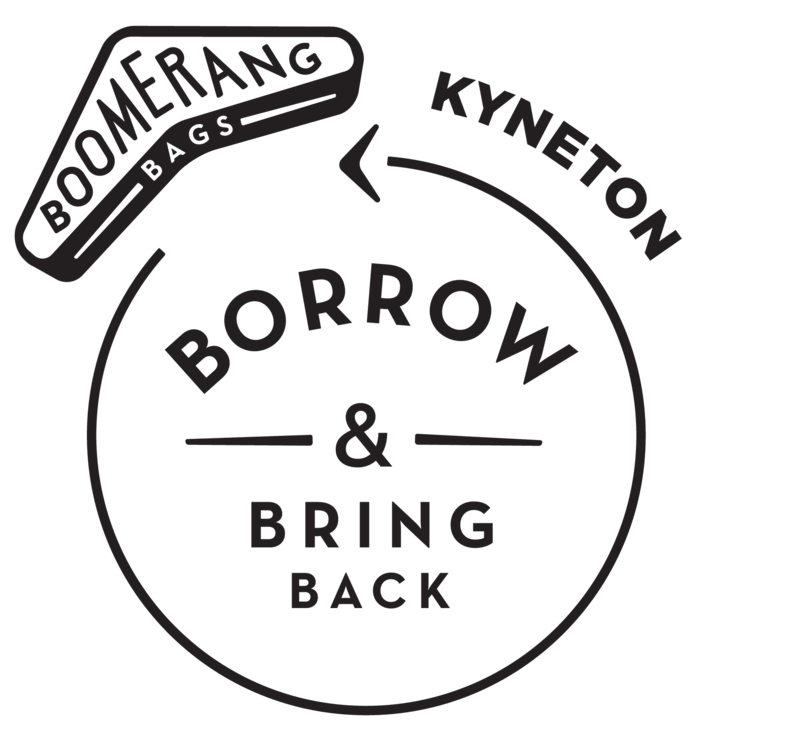 For more information find us on Facebook, email Kynetonboomerangbags@gmail.com or call KCLC on 5422 3433. Why? It’s an opportunity to share your garden dreams and challenges, ask questions, learn and help others. Any questions please call Julie on 5422 3023 or 0425 724 156.